Not a very good movie, well actually it is a mess. The story is ridiculous and makes little sense and the aliens and their vessels look like shite. The movie takes itself very seriously and there is almost not a single funny comment or joke throughout the entire film. The ridiculous story and the look and feel of it all, just can't work without that, especially since it's not bad enough to be funny in itself. Several of the characters: "friendly alien", the boy and the barkeep are all either annoying or ridiculous or both. 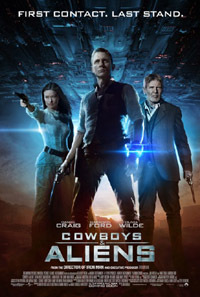 The 2 main actors (Daniel Craig & Harrison Ford) are okay, but even if they try hard there's nothing they can do to save this mess of Cowboys and Indians and crappy Aliens. I had high hopes for this movie, but overall I am disappointed and actually looked at my watch several times during the second half of the movie. It could have been something cool, but it most certainly isn't.